Hugonin's paintings are composed of marks of close toned colour with an underlying grid, each mark shifting slightly from its neighbour and building to a rhythmic whole. These are deeply subtle paintings with an understated clarity: quietly musical and filled with a kind of contained light that relates keenly to the place in which they are made. There is a slow and deliberate colour notation that forms an integral part of the making of each work. As Michael Harrison (former Director of Kettle's Yard, Cambridge) observed, "the paintings carry with them that pace, that slowness, that sense of time. They ask us to slow down, and to look, and to settle as we would to listen to a piece of music, allowing time to take effect - to acknowledge that, for all their quietness and stillness, our relationship to them is one of continual change". A selection of Hugonin's work was shown at the De La Warr Pavilion, Bexhill-on-Sea which then toured to BALTIC, Gateshead in 2006. In 2010, Hugonin completed a commissioned stained glass window in St John’s Chapel in Northumberland and Ingleby Gallery presented a survey exhibition of eight paintings spanning a twenty-year period. Recent exhibitions include Chance Finds Us (2014), Middlesborough Institute of Modern Art and the touring exhibition Walk On (2013-2014). 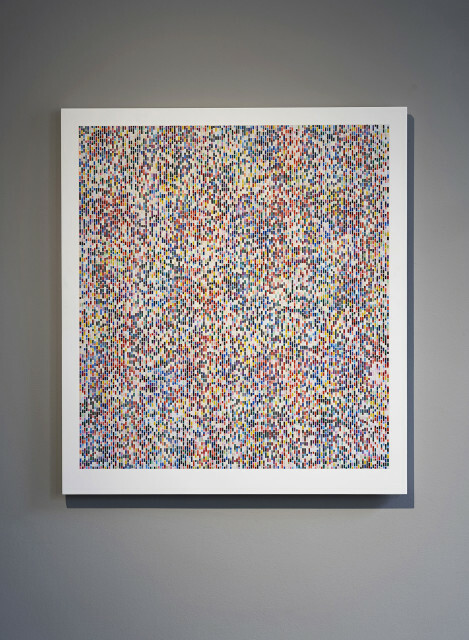 Ingleby Gallery presented a major solo exhibition celebrating the completion of the artist's Binary Rhythm series of paintings in the Autumn of 2015.